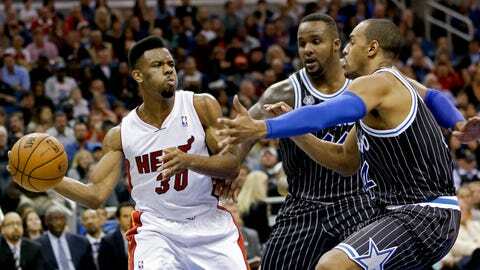 Miami Heat's Norris Cole (30) passes the ball as he is trapped by Orlando Magic's Glen Davis, center, and Arron Afflalo, right, during the first half Saturday night. Rashard Lewis enjoyed productive nights in Orlando during four seasons with the Magic. He had another one on Saturday, when he gave the Miami Heat a big boost in a rare start. Filling in for Shane Battier, Lewis scored 18 points in 30 minutes to help the Heat defeat the Magic 110-94. Lewis’ scoring helped on a night LeBron James struggled from the field. The King finished with 15 points on 5-of-13 shooting. Dwyane Wade and Chris Bosh each had 20 points for the Heat (25-8). Michael Beasley add 13 points off the bench. Miami shot 54.1 percent (40 of 74). The Heat are 15-2 when they shoot above 50 percent. Lewis, who played four years (2007-11) for the Magic, made his second start of the season as Battier was sidelined with a quad injury. Lewis didn’t play at all in Thursday night’s home loss to Golden State. Miami led 81-70 entering the fourth quarter. They scored 15 consecutive points late in the third to take control. Orlando failed to get closer than nine the rest of the way. The Heat led 48-46 after a half in which James scored just 6 points on 2-of-8 shooting. Miami improved to 20-1 when they hold the opponent to fewer than 100 points. Miami scored 15 straight points in a span of less than three minutes to turn a one-point deficit into a 73-59 lead with 3:26 left in the third quarter. Lewis, who scored six points during the key 15-0 run in the third period. Bosh shot 9-of-9 from the field. The Heat play the Toronto Raptors at AmericanAirlines Arena on Sunday at 6 p.m.
You can follow Charlie McCarthy on Twitter @mccarthy_chas or email him at mac1763@bellsouth.net.